President Cyril Ramaphosa appears to not only be carrying the hopes of the ANC’s success in the coming elections, he is also seemingly the only glimmer of hope for South Africans who had no faith in his predecessor. 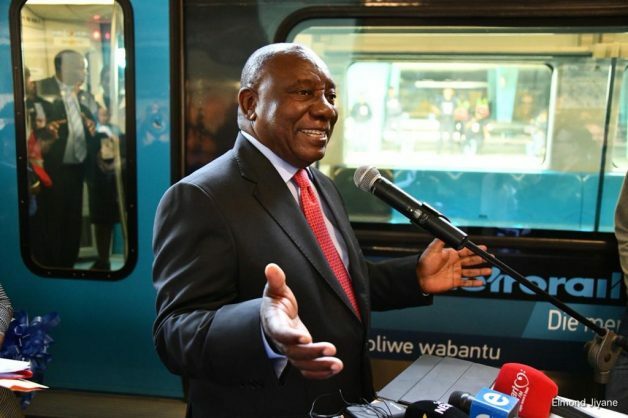 A study conducted by the University of Johannesburg’s Centre for Social Development in Africa (CSDA) showed South Africans have more than twice as much trust in Ramaphosa as they had in Jacob Zuma. The results of the 2018 survey, Wave 2, released yesterday, reveal that public trust in the Presidency increased to 55% since Ramaphosa took over the reins. This is more than double the gloomy 26% scored by Zuma’s presidency in the results of the first survey, conducted in 2017. Analysts say the ANC is heading to the elections divided, with several of its top leaders and Cabinet ministers implicated in grand-scale corruption in sworn statements at the Commission of Inquiry into State Capture. The sluggish economy that is shedding jobs in the face of high unemployment, also isn’t helping its case. The study found that most potential voters were warming up to Ramaphosa’s “new dawn”, bringing back voters who had turned their backs on the ruling party. Most respondents said the ANC would get their vote this year (56%, up from 53% in 2017), followed by the DA at 13%, presenting a dramatic decline from 22% previously, and then the Economic Freedom Fighters, with 9% of the respondents saying the red berets would have their vote, which is up from the previous 6%. According to the results of the October 2017 study, referred to as Wave 1, trust in state institutions was at its lowest during Zuma’s tenure, with 56% of the respondents saying they “were not at all likely or not very likely to trust” Zuma. Zuma’s tenure has been regarded as the most destructive in the history of the democratic South Africa, with key state institutions such as the National Prosecuting Authority compromised, state entities run into the ground and billions of rands lost through corruption. The survey revealed that leadership changes in the ANC appear to have bolstered trust in Ramaphosa and emerged as a significant predictor of voting behaviour. According to Professor Leila Patel, CSDA director and co-author of the study, to understand the shift, they constructed two models for analysis for the change in leadership. She said when Ramaphosa was removed from the comparison, governance or trust in institutions was no longer a predictor of voter preference. However, Patel said when added as a factor on its own and independent of trust in institutions, trust in the Presidency emerged as the single most important predictor of voter preference for the governing party. “Despite huge constraints that a Ramaphosa presidency is likely to face [in order to realise the commitments that have been made and in a divided party], the shifts in voter opinion and choices reported here could mean that there is buoyancy in the public agenda and hope that the ANC under new leadership can forge a path out of our current quagmire,” she said. But Victoria Graham, associate professor in the department of politics and international relations at the University of Johannesburg, said trust and hope in one man was not good for democracy. She said though it was fantastic to have trust in Ramaphosa, her worry was that “… he has to look after himself, because if something happens to him, then what does that mean for our country. The nationally representative voter preference study asked respondent’s specific questions to be able to gather relevant data. The most common reason for voting for a party of choice was a belief that the party will bring a better life (65%), followed by the party that brought freedom and democracy (62%) and the trust in the party (62%). How likely are you to trust in the institutions and leadership of the ANC? Compared with the 2017 study, trust in the SA State Security Agency, police, and social development have increased, while trust in the media and courts worryingly declined. A vast majority of respondents (72%) believed corruption had increased but this was down from the 76% in Wave 1, where respondents believed that corruption had increased between 2014 and 2017. Do social grants sway voters? About 30% of respondents received social grants. Interestingly, 48% of all respondents said one reason they voted for a particular party was because it paid social grants and that another party would remove the grants. 34% of respondents supported land expropriation without compensation and 46% support expropriation with compensation, while 20% did not know.